Founded in 1905, the magazine Variety is the daily gospel of the USA&apos;s entertainment industry. In 1992 it published Variety: Comedy Movies, which represented an encyclopedia of the best of more that 300 comedies stretching 87 years. The list included pictures of Charlie Chaplin, Buster Keyton, Mel Brooks, Blake Edwards, Woody Allen, Steven Spielberg... and Jamie Uys. In May 1983, gossip abounded that MIMOSA FILMS was secretly planning a sequel to THE GODS MUST BE CRAZY. Following the unexpected and explainable global success of THE GODS MUST BE CRAZY, Boet and Uys were hot property. The major Hollywood production houses showered MIMOSA FILMS with over the top offers…mammoth budgets, cutting edge technologies, expert editors, sophisticated crews, anything and everything they desired. But the film makers had never been keen on sequels. By October 1984 Uys was still mulling over storylines. Finally, in March 1985 he had a set story…of sorts…kind of… Instead of a Coke bottle, he was going to drop an American yuppie from the heavens. He traveled to the Big Apple to see how they exist. “I think that should work, because a New Yorker lives in a cocoon and you wouldn’t expect him to survive in the bush. And yet, he does because, after all, he is a New Yorker.” He was also thinking about a new title: When I first thought up the name, I thought it was wonderful – now I don’t think so.” At the end of the day, name recognition prevailed. If he was going to have an American character in the female lead, he could as well cast an actual American. He traveled to the USA to meet with actresses and do screen tests. There were about fifty well-known names but he was not entirely sure. “I don’t want household names in my new movie.” Uys didn’t want to cast Marius Weyers and Sandra Prinsloo again. He felt their characters were spent. He said in May 1986 that he wanted new faces and had to make up his mind quickly as primary film was to commence in two weeks’ time! In 1986 Boet sold the unseen sequel at Cannes amidst tremendous media brouhaha. Filming of the $10 000 000 production could now really start. N!Xau, whom Uys called “a really brilliant actor,” would take the lead in THE GODS MUST BE CRAZY II. Uys finally cast the drop dead gorgeous Lena Farugia (a born New Yorker who lived in South Africa) in the female lead: “In the sequal I’m the equivalent of the Coke bottle which dropped from the sky in the first GODS... It is a wonderful story and Jamie Uys has written some terrific comedy lines. I read for the part several times before Jamie decided to cast me.” She said that the original was very ‘charming’ but the next installment was much funnier. The dashing South African actor, Hans Strydom, was picked to play alongside Farugia. By late 1987 Uys was still rolling cameras as the dream of a quick production was now forgotten. On set the Bushmen called him Ta-ra-ra, because that’s what he would hum if a shot was successful. That little tune was heard seldom as Uys as a rule would shoot a scene sixty times over – or more! He sent word that he desperately needed a ‘tame badger’ that would have a “bloody important role.” He got one. The badger that tormented Strydom’s character, stranded in the desert, was viciously cute. Travelling between locations, hundreds of kilometers apart from one another, the badger had to sit on Farugia’s lap. She christened the critter Coco Chanel as it never stopped farting! The entire picture was filmed exclusively outdoors. The picture was season bound and as such, the team had to wait a year for filming to continue – all the while hoping that the natural settings hadn’t been destroyed by pests, winds, floods or fire. With every minute being precious, it is important to consider that, for example, the scene where the micro-plane crashes in the gigantic Baobab tree took three weeks to film. The most stressful scene was where the poachers set the veld on fire. For obvious reasons, it could be done only once and controlling a bush fire (with lions, elephants and their trainers plus seven actors as well as a crew in it) was fantastically risky. In 1989, special effects work started at the historical Pinewood Studios (synonymous with the 007-franchise) in England, and the picture, having taken about five years, was finished. “It’s like coming out of the army! You have to learn to adapt to normal life again,” said the exhausted film maker. 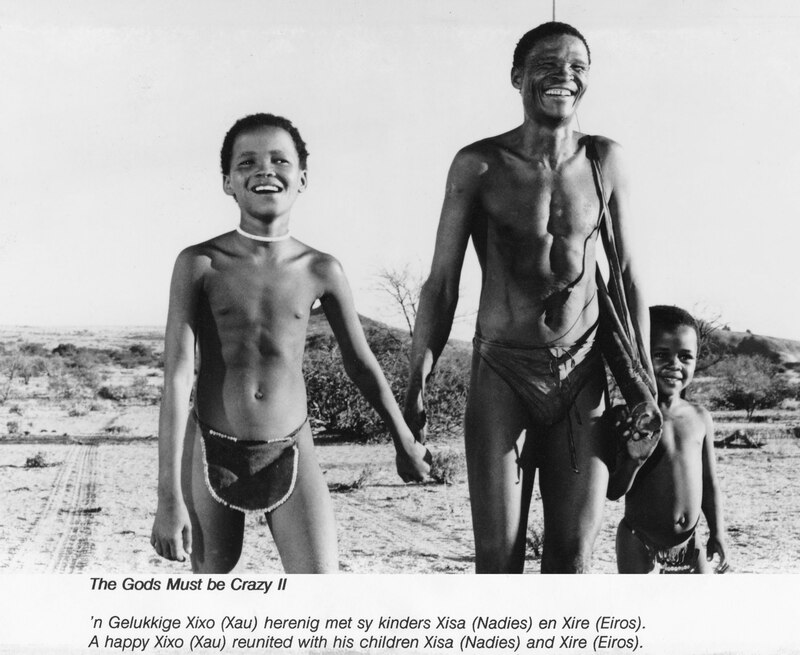 On 13 October 1989, THE GODS MUST BE CRAZY II was released nationwide in South Africa. Within only fourteen days it was the single most successful film to be screened in South Africa – ever. Like its predecessor is steamrolled global audiences.